Abstract work processor – takes work units and turns them into WorkResult instances. 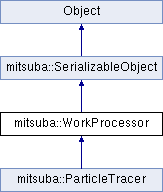 When executing a parallel task using Mitsuba's scheduling system, the actual work is done in an implementation of this interface. The class is serializable so that it can be sent over the network if required. It is possible to keep local state in WorkProcessor instances (e.g. scratch space for computations), though anything not returned in the form of a WorkResult will eventually be lost. Each Worker (both locally and remotely) has its own WorkProcessor, and therefore no form of locking is required within instances of this class. Create a copy of this work processor instance. In practice, before the cloned work processor is actually used, its prepare() method will be called. Therefore, any state that is initialized in prepeare() does not have to be copied. Create a work result of the proper type and size. Create a work unit of the proper type and size. Look up a named resource, which has been bound to the associated parallel process. Throws an exception if the resource is not known / bound. Called once before processing starts. This is useful for allocating scratch space or resolving references to resource objects. Lengthy computations should be performed in process() instead of here, since this this method will be called while the central scheduler lock is held. A thrown exception will lead to the termination of the parallel process. Process a work unit and store the computed results. The active parameter can be used to signal a premature stop of the execution flow. In this case, the work result is allowed to be undefined (it will simply be ignored). A thrown exception will lead to the termination of the parallel process.